1. Marinade prawns in soy sauce for 10-15 minutes. 2. Heat coconut oil on medium flame in a wok. 3. Add garlic and fry until slight golden brown. 4. 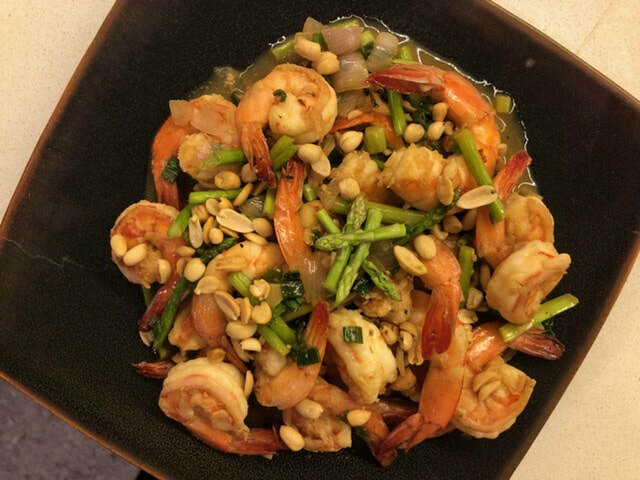 Add lemongrass, prawns, fresh chili and stir-fry for 1-2 minutes until prawns are no longer pink. 5. Add onion, stir for another 2 minutes. 6. Add asparagus, stir-fry for another minute. 7. Finally add fish sauce, honey, lime juice, stir well. 8. Garnish with chives and roasted peanuts.